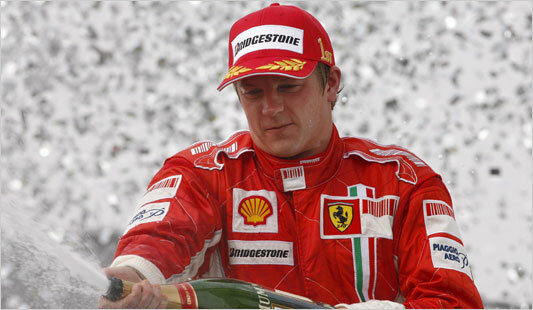 So new forum, new Fan Club for Kimi! Hopefully, we are continuing here so enthousiast as well as in the old forum! LadyR a écrit: So new forum, new Fan Club for Kimi! I am in so no worries. Thx god...it's our duty to keep the King KR alive! Hi ! French fans rpz ! Zonked Thanks for opening Kimi Fan club. (I thought at I have a privilege being Finn and all. (Sniif). Most important thing is at he is alive and well in our Forum's. (add. Happy smiley here). You found your, he is here alright. (add. Very Happy smiley here). Great to see you back MissFinn! Very Happy to see you too Lynn-rex. Hoping at rest of the Kimi gang comes back, and then we go and follow Rally. Did any of you participate/read James Allen Poll? Kimi was ranked 5th. arizal_adl a écrit: Did any of you participate/read James Allen Poll? Kimi was ranked 5th. Here in OZ we dont see those report's. Could you tell us more, is it BBC report from England?? Thanks, I will see them now. Hey, that's an English version of the poll. Hey, you should see at what Finnish poll would say, or Italian, or Spanish, or Argentinian. I think your poll is biased, as I never had a change top vote in it. I didnt participate.. but i like to read.. to see other point of views. I may not agree, but would like to know anyway. Some have very interesting perspective. as for other poll... i cant, since i dont speak any other languages aside from english, and my national language. Yeahh....will miss your antics Kimi my man. Hope there's one final surprise in store and you land up in the Merc. Nav, thanks for showing up here in Kimi Fan Club. Hope more Kimi fans are back here. Waiting for IceMaiden to show up. Wonder anyone could get in touch with her? Thanks for dropping by Zag! Spoke with a Finnish Journalist that I know and...(stuff about jv and the new teams and then he said)...he thought that Kimi may not be finished quite yet and thought he might end up with Brawn/Mercedes. "I think it will be Raikkonen and Rosberg at Brawn"